“Signs of spiritual growth are subtle at first and yet, eventually, evidence of our inner work becomes so obvious that our world is transformed. Before the transformation bears fruit, however, we must labour with great trust when we have no sense of our growth happening. We may indeed worry that we are deluding ourselves about any progress being made at all. We might fear that our spiritual practices, prayers, meditations or study might be little more than a passing fancy or a foolish hobby. Do not let such sabotage enter your heart, beloved. The Mother brings you a message that you are, indeed, growing and you must guard your faith vigilantly. It is one of your most powerful assets on the spiritual path. It is during those times when we are yet to see evidence of our growth in the physical world, that we can feel most uncertain, most tested – yet we must, we simply must, choose trust and faith, no matter what. It may be weeks, months or years before we feel we have enough proof int eh physical world to justify our spiritual beliefs, but this matters not. What matters is trust. 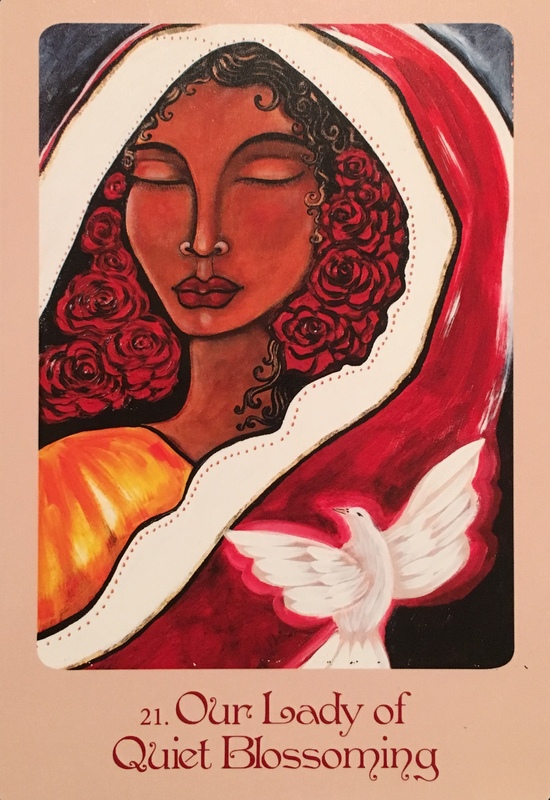 The Divine Mother comes to you in this oracle telling you that she can see, hear, and feel your growth. She knows you are going to succeed spiritually, and you can trust her, when you cannot trust your own senses. In time, your growth will have demonstrated itself in the world through your manifestations, and this will inspire you with even more trust to continue on the path. For now, have faith. Even the greatest creations stared as a single seed of thought. This oracle comes with a special message. Do not give up. Do not let go of your dream. Stay at it. Keep working on yourself. If you are struggling to have faith, do the healing process for this oracle at any time. Soon enough, your uncertainty or tentativeness will be replaced with great confidence, certainty and knowing. Until that moment, and even then, trust without condition. The oracle also brings this message to you: you are asked to trust in your inner senses or feelings about a person, opportunity or situation. Sometimes what doesn’t seem that promising on the surface of things, can hold tremendous promise and will be the foundation for your divine success. Likewise, sometimes what appears to be wonderful is actually not much more than a glossy surface, which will do little to support or nourish you, in actual fact. You are being asked to have the courage of your inner convictions, and to trust your own sense of intuition about what is happening in your life, or soon will be. If you are stuck trying to make a decision, look within. What does your heart tell you? Mother Mary will speak to you through your Divine heart, and her counsel will always be wise and true. Do not take things at face value, but look beneath the layers; feel into it. How does it feel? Does it feel Light, easy and flowing? Or does it feel like a struggle? What is your heart whispering to you? Rise above the desire to control the outcome and look at this from another perspective. Does this decision, opportunity, or person feel in alignment with your Highest Good? Does it feel in alignment with the Highest Good of All? This is key. You cannot force things to go the way that you want or wish them to go; for when we do this we meet obstacle after obstacle. We are dealing with projections rather than truth. If the Universe is showing you red flags, heed them. If the Universe is giving you a big green light, go for it! Feel into it. Know that when you decide from the heart, you cannot go wrong. My crystal message for today.